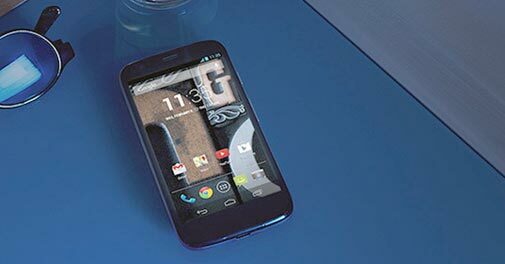 Motorola has announced the launch of the Moto G, an affordable Android smartphone, in the Indian market. A dual SIM smartphone, the device will be available in two variants - 8GB and 16GB. While the 8GB variant is priced at Rs 12,499, the 16GB will come for Rs 13,999. The Moto G boasts a 4.5-inch edge to edge screen with Corning Gorilla Glass protection. It has a 1280 x 720 pixels resolution display with 329 ppi and a water-repellent nano-coating. The smartphone will be powered by a 1.2 GHz quad-core Qualcomm Snapdragon 400 processor with Adreno 305 GPU and will run on Android 4.3 with an option to upgrade to Android KitKat within a few days. This is paired with 1GB of RAM. Also onboard is the 5MP rear camera with LED flash, 720p HD video recording at 30fps and a 1.3MP front-facing camera. Weighing 143 grams, it packs in a 2070 mAh battery and offers connectivity options including 3G, WiFi, Bluetooth 4.0 and GPS. Magnus Ahlqvist, GM of EMEA and Asia Pac, Motorola Mobility, said: "We think everybody deserves to experience mobile Internet at its best, and price shouldn't stand in the way of anyone owning a technologically advanced smartphone. Moto G promises its users a best-in-class mobile experience at an unbelievable price." Looking beyond the traditional distribution model, Motorola plans to sell Moto G only through the online shopping portal, Flipkart. The smartphone will be available on Flipkart starting February 6. Flipkart also plans to offer some discounts on the same.